In some strange way, I felt relieved as I strode towards Lenox Hill Hospital’s Emergency Room with my plastic bag full of still-wet CAT scans; at least I knew what was wrong, and what had to be done. It was a strange day from the start. I’d slept scarcely a wink the night before, dragging myself pathetically from the bathroom floor to the couch to the bedroom, hunchbacked and mute from nausea, vomiting, and flashes of fever and chill, fever and chill. As the sun rose over a new week, it all felt too familiar. I called in sick, then fell into a fitful sleep. Moments later, the phone rang. The Big Boss needed to see me at noon. Alone. It was, as they say, an invitation I couldn’t refuse. And so I shaved three weeks of beard from my face, pulled on my sport coat, and limped into the office. As I walked down Tenth Avenue, I noticed that the pain — once present from chest to my knees — was growing sharper and more concentrated, like knives in my groin. As I sat in my office waiting to be summonsed, it dawned on me that now would be a good time to call a doctor. Two hours later, I was at 65th & Park describing my symptoms. “It feels like someone’s constantly kicking me in the balls,” I said. For some reason (perhaps finally explained by this week’s diagnosis), Lenox Hill Radiology has become something of a second home. In the last five years, I’ve had three ultrsounds in the dingy, well-worn offices: two for my, um, groin, and one for my heart. On Monday, though, they hauled out the big gun: the Philips 64-channel, thin-slice, computed tomography medical imaging system. I checked in just before four o’clock, and was handed two twenty-ounce bottles of chalky-white barium sulfate. I chugged two, then sat down. A few minutes later, she gingerly approached with a bottle of red liquid. The red stuff was just as disgusting, especially on an empty stomach. The wait was even worse. Finally, though, another attendant ushered my into a back room, into a gauzy, blue and white gown, and onto a flat tray in the middle of a huge, plastic donut. He strapped down my legs, raised my arms over my head, said, “Just follow the instructions,” and stepped out of the room. The scanner began to quietly whir around, slowly sliding me through its laser aperture. I lay there quietly considering love and death, and just what might come next. I took a deep breath when the automated female voice instructed, exhaled, and did it again. The attendant stepped back into the room. 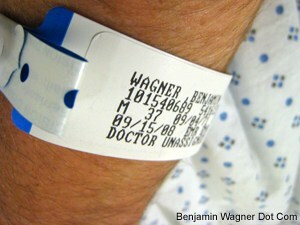 “Lenox Hill ER is across the street,” he said handing me my clothes. “You take these scans. I’ll call your doctor,” he said calmly. Come on…don’t leave us hanging like that! I am guessing you survived, but still. I hope your recovery hasn’t been too bad. Yikes! Glad you’re (apparently) OK.